The City of New York has more than doubled the $100 million it pledged to the Atlantic Yards project, though a spokesman yesterday offered an explanation that left some questions unanswered. Mayor Mike Bloomberg's capital budget, released last Thursday, includes $205 million designated for Atlantic Yards, though the city had earlier agreed only to $100 million. I contacted City Hall Friday morning, asking about the source of the funds and the relationship to "extraordinary infrastructure costs," but didn't get a response. Yesterday afternoon, after sending a reminder, I received the following response from Deputy Press Secretary John Gallagher: "The additional funding is for infrastructure improvements, several of which would have been required with or without the construction of the Atlantic Yards Development and others that are necessary regardless of what is built on the site." However, in the MOU signed 2/18/05 by the city, the Empire State Development Corporation (ESDC), and developer Forest City Ratner Companies (FCRC), the city agreed to contribute $100 million for site preparation and public infrastructure improvements on and around the arena site, and also for a portion of the costs of the acquisition of the arena site. However, another clause states that "Public Parties will consider making additional contributions for extraordinary infrastructure costs relating to the mixed use development on the Project Site (excluding the Arena Building Site)." 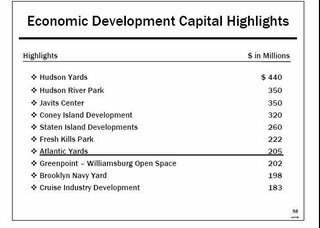 Given that the $205 million is listed under "Atlantic Yards," the additional $105 million would seem to fit under the rubric of "extraordinary infrastructure costs." I asked Gallagher about that, but he didn't address that in his response. 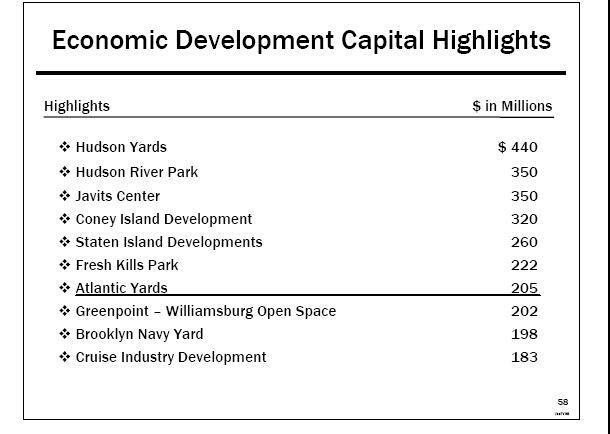 However, Doug Turetsky of the Independent Budget Office confirmed the suspicion; he told Neil deMause of the Village Voice that the additional $105 million would go to more infrastructure costs, "some of which might have been on the books prior to Atlantic Yards, but some substantial amount of which is likely related to the scale of the project—such as the need for expanding sewer and water capacity." I asked Gallagher how much the city might pay over several years, but didn't get an answer. It's likely that some on the City Council, notably Council Member Letitia James, will be asking questions before this budget passes. Whether $105 million or more, the additional payments would diminish the amount of potential new net revenues, even as those estimates continue to shrink. Gallagher ended his brief message with some boilerplate: "This project will create jobs, provide affordable housing and generate billions of dollars in tax revenue and represents a solid investment of taxpayer resources." Whatever the tax revenue, the net new revenues, previously estimated at $944 million, apparently just went down more than ten percent. The City and State of New York have each agreed to contribute $100 million to Atlantic Yards, representing less than six percent of the total investment in the development. These monies will be used to fund infrastructure improvements and site preparation on and around the arena site (including streets, sidewalks, utility relocation, environmental remediation, open space improvements and public parking garages). Nowhere in the country do so many people get so little local coverage. Remember, Brooklyn would be the country's fourth-largest city by population were it independent. But it doesn't have its own newspaper. Could you imagine if cities like Houston (fourth-largest) or Philadelphia (fifth-largest) quietly planned to double their contribution to the most ambitious development project in their city's history? Surely, a reporter at the Houston Chronicle or Philadelphia Inquirer would've noticed the numbers in the mayoral budget. In New York, however, the mayor's office is covered by reporters for the dailies who don't know much about a project in Brooklyn, and the reporters in those dailies' Brooklyn bureaus are often stretched too thin to dig. So it's up to independent journalists like me and interest groups like DDDB to raise issues that should be part of daily coverage.